TV Guide, Episode Lists, Photo Album & Games! - A Walk With Grandpa Walton Site! Walton Family - Share Your Favorites! *All Walton family members, plus their loved ones, friends, and neighbors! *Pictures, also, of each one! Includes screen cap images of the Walton family. Re-live the Walton's episode... The Sinner. While singing along to the tune of the song Grandpa started at the end of the show, "Just as I Am!" This won't be an easy task... but now you can vote your favorite Walton Family Member and see the results of others who voted! Feel free to return and vote for other members! Only remember, one vote per day! Save this background picture of the Walton family to your computer to use as e-mail stationery. A lovely way to share your enjoyment of The Waltons. 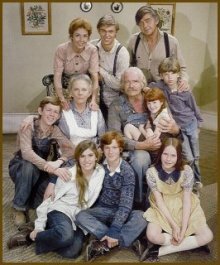 Visit this page to view TV Guide Cover Photos of The Waltons plus click on the actors and actresses of the show to see who may be on Television tonight! This is where you will find a complete list of each Season of The Waltons, along with a description of each program. Challenge your Family and Friends to some good old fashioned Walton-Style Games. Race against the clock our outwit the computer. Games to play on the computer or print and play anywhere!